One of the brightest and largest members of the Virgo cluster of galaxies, M100 is a beautiful example of a grand design spiral galaxy - a type of galaxy that has prominent and well defined spiral arms. M100 also has a distinct nuclear bar as well as a large star forming region called a circumnuclear ring (CNR). As a result, M100 earns a classification as a starburst galaxy. Also prominent in this image are a number of surrounding galaxies including NGC 4328 (left of M100 at 9 o'clock), NGC 4322 (11 o'clock), and NGC 4322 (1 o'clock). Careful examination of the image will also reveal numerous faint background galaxies. 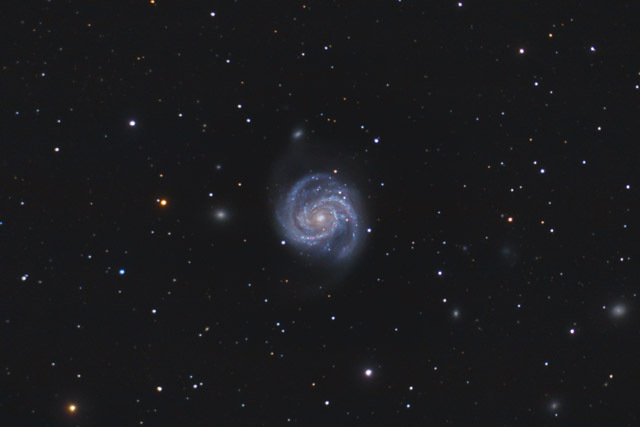 Software Used Images Plus 5.0 for camera control, Images plus 5.5 Beta for calibration, stacking, digital development, star size reduction and halo reduction, smoothing and noise reduction, advanced Lucy-Richardson deconvolution, and multiresolution sharpening. Photoshop CS5 used for levels and curves, high pass filter, star shrinking, screen mask invert, lab color, saturation adjustments, vibrance, match color, and selective color. Gradient Xterminator for gradient removal. Carboni Tools for additional noise reduction, and smoothing. HLVG for additional color correction. Registar for aligning stacks. Focus Magic for focus restoration. Notes M100 is a beautiful galaxy and I'm pretty happy with this image. If I had realized this galaxy had as much to offer as it does, I probably would have invested another night or two capturing data. This image tied for first place in Astrophotogallery.org's Hard-Galaxy category for May 2013. This image was published by Astronomy Magazine as its Picture of the Day for October 2, 2013!